Recently someone wrote in an #AskKatya question and asked the following about her new rescue dog: “My adopted dog keeps getting into the cat litterbox! I live in an apartment so my box locations are limited. Are there any other tricks I can try?” Well, unfortunately it’s not that unusual for a pooch to want to get into a kitty box! Here are a few helpful suggestions you can try. 1. Baby gate. Often a baby or pet gate in the doorway of the room that has the litterbox is the quickest and least expensive solution. If you have a bigger dog, you can purchase a tall pet gate with a built-in kitty door in the bottom. If you have a smaller dog who will not jump a shorter gate and your cat doesn’t mind jumping over it, try a shorter gate. Some baby gates are made out vertical metal bars that a cat can easily fit through, but a dog can not. It can take trying a few heights and styles to find one that works best and is safe for both your pets. IMPORTANT: Options 2 through 6 below are all trying a new location for your cat’s litter box. MAKE SURE you are adding a 2nd litter box, and your cat is happy using the 2nd box, before you remove the 1st. Show your cat the new box, and praise him anytime you catch him using it. Once he is using the new box for at least one week, you can then remove the original litter box that the dog was accessing. If your cat doesn’t use the new litter box, you can try leaving it there another week longer, or you may need to try another option. It is not a good idea to make sudden litter box changes, and do not try to force your cat to use the 2nd box by removing the 1st. That could cause them to stop using the litter box and finding a spot – like your rug or laundry basket – that they prefer! It can also cause stress which can lead to health problems. 2. Higher up. Another option is while leaving the original litter box where it is, try putting a second litter box up high somewhere in your home that your dog can not reach, like a table or shelf. The higher platform needs to be VERY sturdy and allow for enough room so that your cat can get up onto it, move around, and step into the litter box. 3. Bathtub. Another recommendation for keeping your pup out of the litter box is to put a 2nd box in the bathtub – most dogs won’t jump in the tub, but most cats will! 4. Closet with a cat door. If your dog is too big to fit through a cat door, you can put the litter box in a closet or other room, keep the door closed, and install a cat door to give your cat access. 5. Covered litter boxes or a litter box enclosure will deter some dogs, especially if you turn the opening towards a wall or in a corner, and your cat can easily access the entrance, but your dog can not. 6. Top-entry litter box. 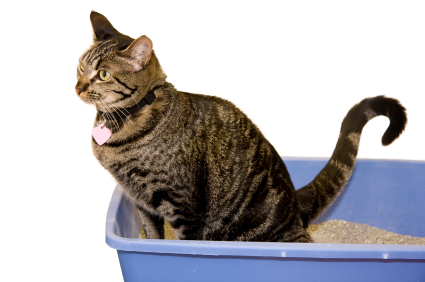 Try a “top entry” style of litter box that your cat enters from the top. Many pet retail stores sell these specially made litterboxes, created just to prevent problems such as dogs getting into them. Hopefully this will help you solve the problem so that you, your cat and dog can all live together peacefully and happily!